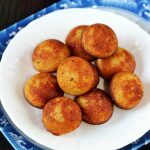 Sweet paniyaram recipe – South Indian breakfast or snack recipe. 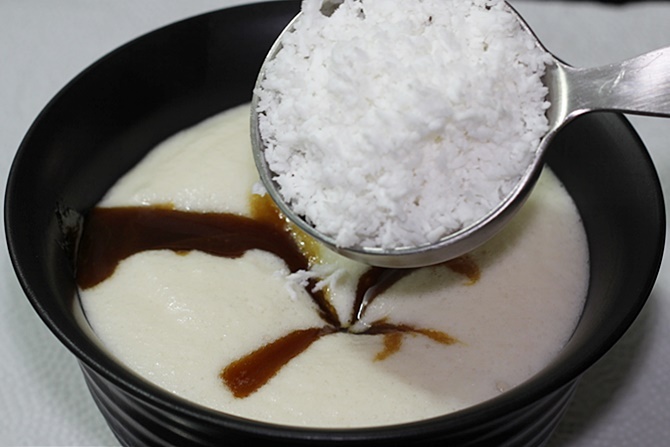 Paniyaram can be sweet or savory, sharing the sweet version made with idli dosa batter. 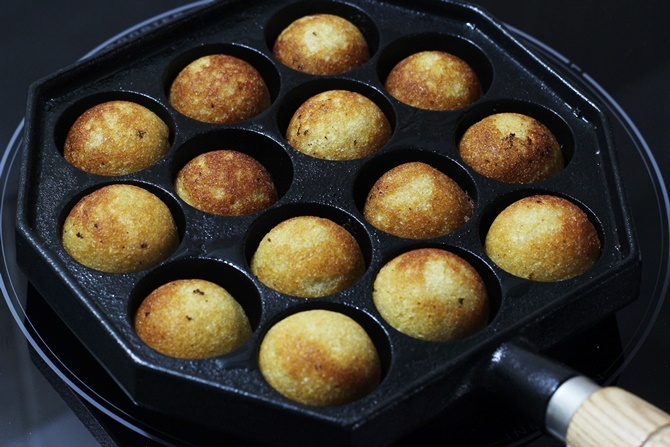 To make these, fermented lentil rice batter is cooked in a special pan known as paniyaram pan or Aebleskiver pan. 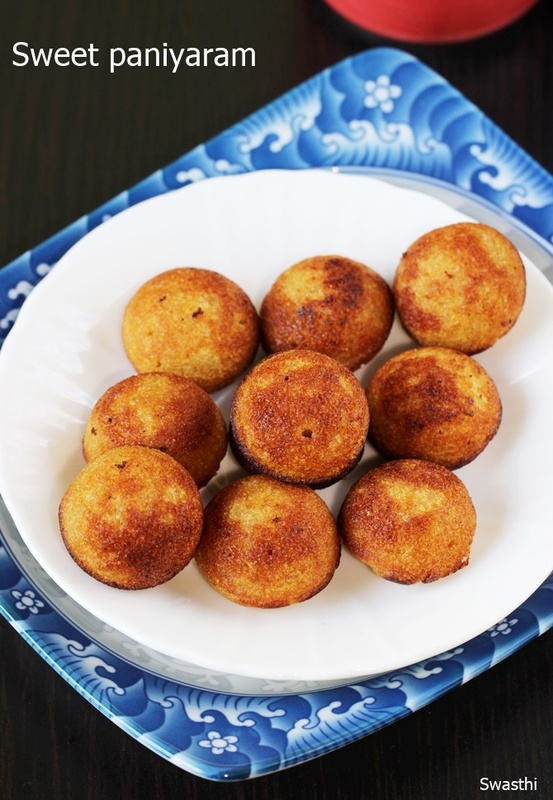 Though the traditional recipe is made using fermented rice lentil batter, there are also instant and quick recipes like this Sweet instant paniyaram using wheat flour, rava and maida. 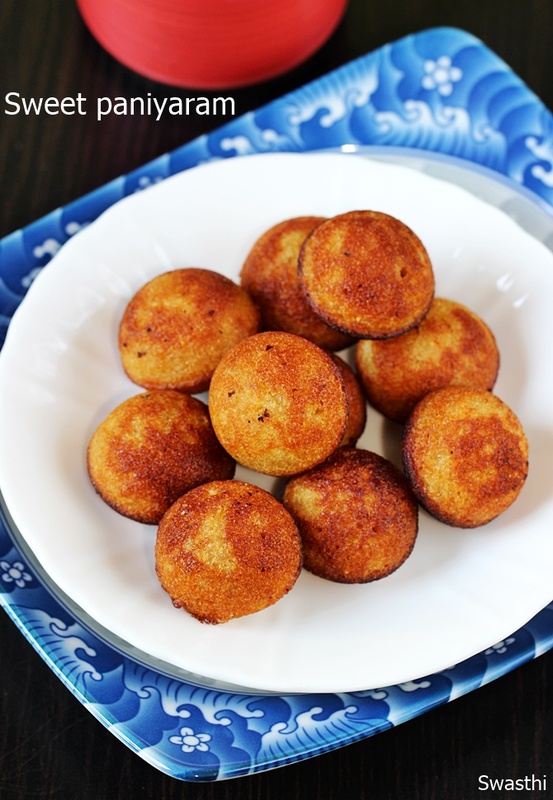 The recipe I am sharing is just one of the many quick methods to make sweet paniyaram. 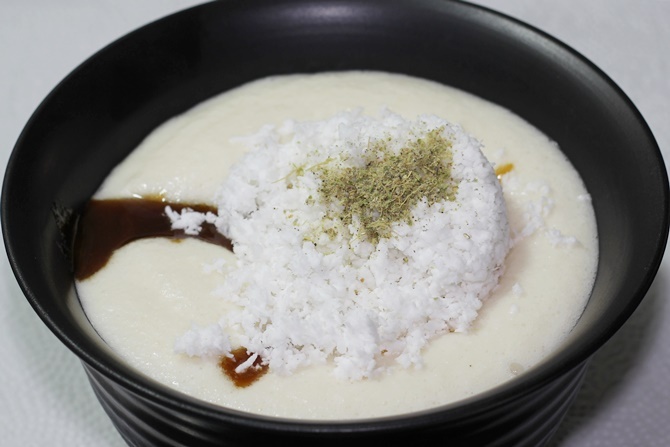 If you have fermented idli or dosa batter, then you are good to go with this recipe. This time I have used idli batter, you can also use thick dosa batter. Runny or thin batter is not suitable to make sweet paniyaram. These will be loved by kids and go well in the school box or can be had after school too. If packing in the box, be sure not to use sour batter. 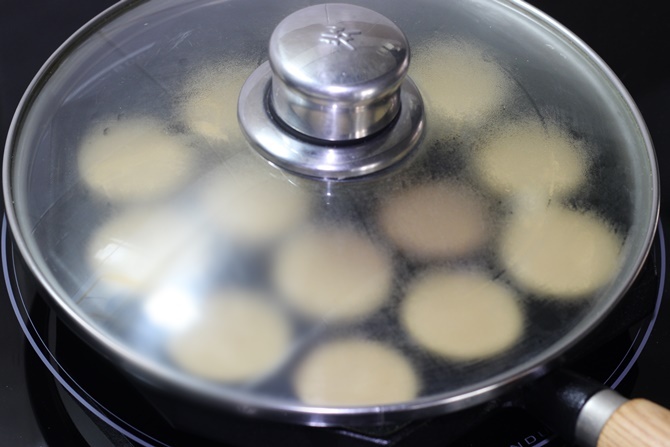 This recipe makes about 24 medium sized sweet paniyaram. 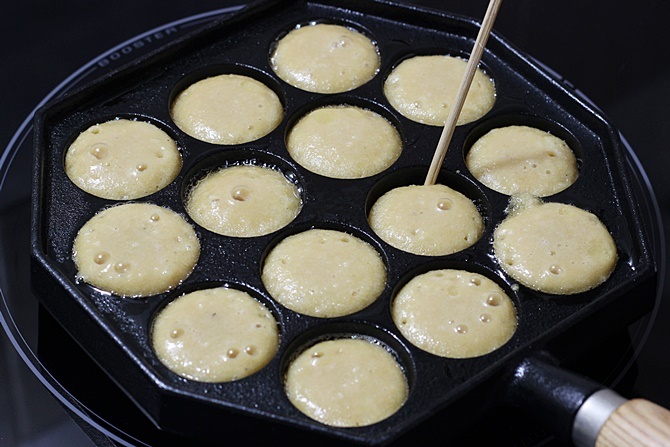 Easy sweet paniyaram made in Aebleskiver pan using fermented lentil rice batter. These can be served as breakfast or snack. Make sure you use thick batter. Use clean grated or powdered jaggery free from dust and stones. If your jaggery is not clean, melt it with 1 to 2 tbsp water. Filter and boil until thick. Then cool it and use here. 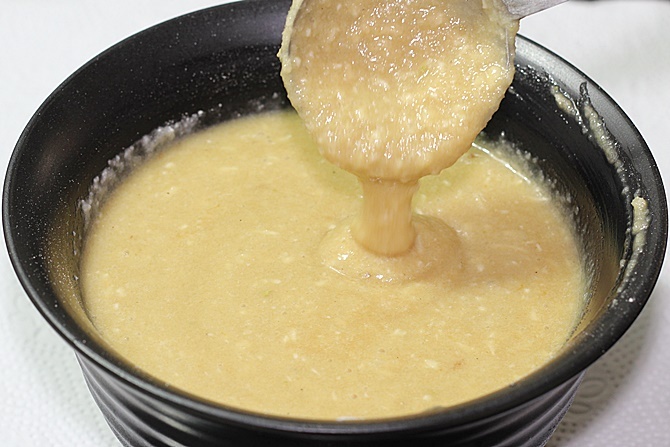 Mix all the ingredients together to a thick batter. 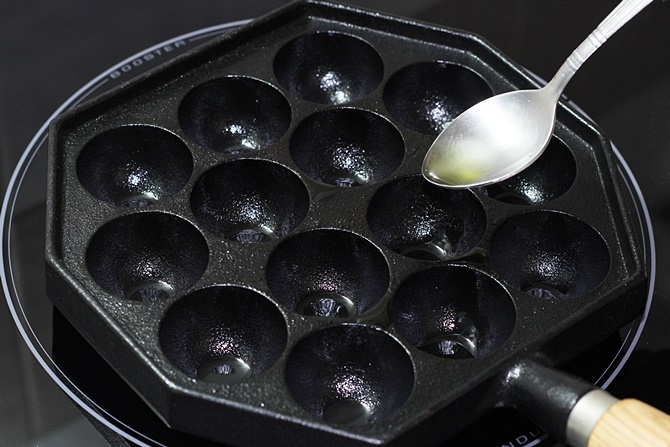 Grease the paniyaram pan and add few drops of oil in all the moulds. Heat up well. Turn the flame to medium and fill the moulds to ¾. Cover with a lid and cook. When the base is set, flip them to the other side and cook until done. Serve sweet paniyaram hot or cold. 1. 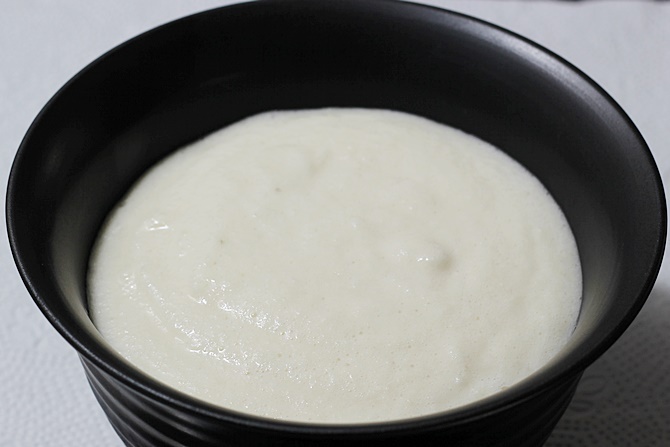 I used 2 cups of fermented thick idli batter which was prepared in 1:2 ratio (dal:idli rava). You can use idli or dosa batter made with any ratio of dal, lentil, poha and methi. Do not use sour or thin batter. 2. Add ¼ cup grated or powdered jaggery. You can also use 2 tbsps more if your batter is thick enough. 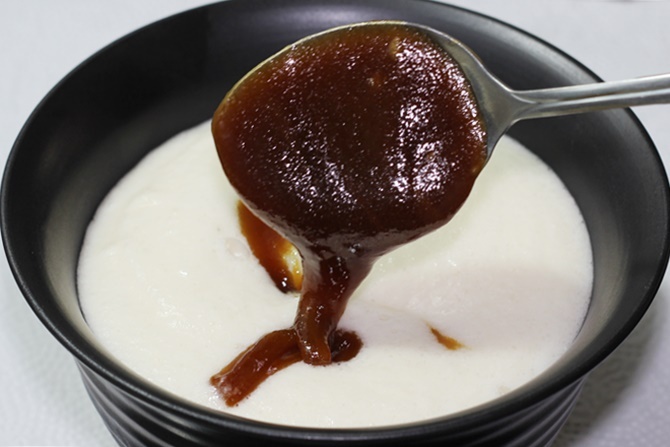 I have used thickened jaggery syrup made from raw jaggery. Note that thin jaggery syrup cannot be used here. You can also use palm jaggery, coconut palm sugar or sugar or raw jaggery. Make sure your jaggery is free from stones and debris. 3. Add ¼ cup grated coconut. 4. Add 2 generous pinches of green cardamom powder. Mix well. 5. 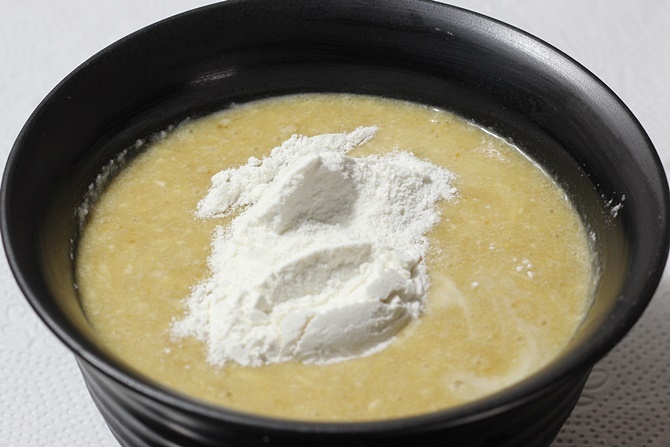 If your batter turns thin or your batter is made of only 1:2 (dal:rice) ratio, then add 2 to 4 tbsp rice flour. I used 4 tbsps rice flour. Adding too much rice flour can make them hard, use only as needed. Using rice flour helps to make them crisp. 6. Mix well. The batter consistency must be thick but of pouring consistency like shown in the picture. 7. 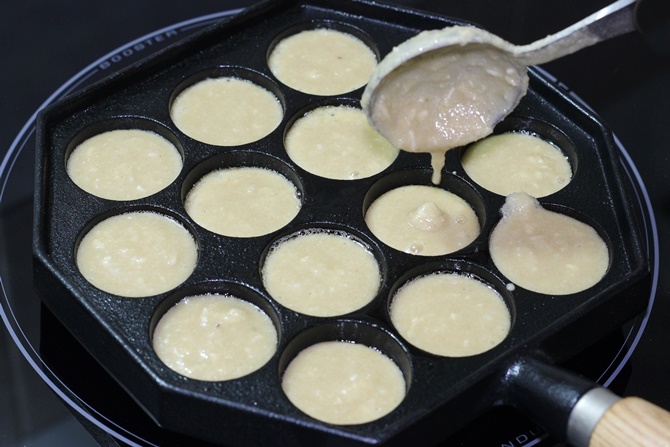 Grease your paniyaram pan well and add few drops of oil/ ghee in each mould. Ghee tastes good if eating them right away. 8. When the pan turns hot, lower the flame to medium. Fill the batter upto ¾ of each mould. 9. Cover and cook on a medium heat. Due to the addition of jaggery they take time to cook. So it is good to cook on a medium heat. 10. When the base looks firm and cooked, flip them using a skewer, chop stick or a spoon. I prefer to add few drops of oil to each of them before flipping. 11. Cook them until they are done on the other side as well. Serve sweet paniyaram hot or warm. Are your moulds non-sticky??? Bcs wen I made these…i was nt able to flip paniyaram as they got stuck in d mould…wat went wrong??? You are welcome. Nice to know you. I bought this in Takashimaya. Yes it is a cast iron pan, non enameled and induction compatible one from a japanese brand called iwachu. But it is very heavy when compared to the Indian made cast iron paniyaram pans. I think you can give them a call first and find if it is in stock. You can also check in crate and barrel. Hope this helps. Hi Swasthi, thanks so much for your prompt reply. Really appreciate it. Will definitely take a look when I go to Orchard road. Thanks again! Thanks for your interest. I have not made a cook book yet. Hi,I saw your recepie for the sweet paniyaram, however can you share a recipe for the sweet paniyaram using wheat flour,?. I also want to check with you if you are on Instagram? You are welcome. I am really too late in replying you. Yes will share the recipe soon using wheat flour. I am on Instagram. You can check me here https://www.instagram.com/swasthisrecipes/. Thanks you. Have a lovely week ahead. You are welcome. Pleased to know you. So Glad to read your comment. Do try and happy cooking.